: He was always around my Grandmother's house. I was told about him regularly and heard his music since i was born and could always sing along. : That beautiful face. And he could sing like an angel. "My Message to Elvis": I would like to tell him that if it wasn't for i him i would not have the variety of music that i have to day, and that i love him very much. : I LOVE King Creole because he is such a rebel, and that is the movie with the best story line and his best acting is portrayed there. And my favorite song is Can't Help Falling In Love. That song is gonna be my weding song one day. 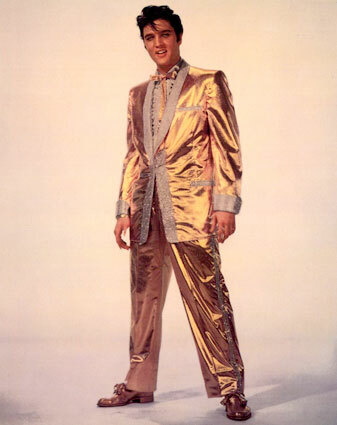 : The Gold Lame is the best, But i like all of the jumpsuits of the '70's. : God, is by far the first i think. and then women. : I wasn't alive. But my mom told was 10. And she said that her and all of her older sisters crowded around the television and cried when it was told on TV. : Because he is part of american history, an icon, soone who contributed to the culture that we enjoy. but also a blast from the past when america was so simple and @ a time when a poor boy from Mississippi could just become a star almost over night. : No i haven't but i'm going soon. I am only 16, but even though you are past and gone for now I know how much you still mean to everybody. How much you mean to me. I can honestly say that i have heard every scrap of everything you ever recorded. And all of everything that has ever filmed you. And besides the fact that you took the world by storm, it wouldn't have made a difference that you were so beautiful because you were the most talented being to have ever to enter this world. You had a talent that the world abused and took for granted and now it's gone and lost. I am sorry for that.
" Oh, my love, my darling I've hungered for your touch, a long lonely time And time goes by, so slowly and time can do so much Are you, still mine? I need your love, I need your love God speed your love to me"
: My name is Bobbie. I am Sixteen and was grown on Elvis everything. Thanks to my grandmother. She talked about him so much that I had no idea that he was dead until I was about 8 or 9. I have seen every movie, and heard every song, and every interview. Anything that i can get my hands that says Elvis. I but everything Elvis and talk everything Elvis. My friends say i should have been alive in the '50's. But you wouldn't think so to look at me because i am what some people would call "gothic", "emo punk", or "deathcore" style in my clothing style. but I love Elvis very much and he is the most talented artist that ever lived and I want the younger generation to recognize that. It`s always great to hear from the younger fans, thank you for comments on our survey. Elvis was truly amazing, His talent struck the world! Elvis looked stunning in any costume; I also liked him in his jumpsuits from the 70s, very tasteful! He was totally perfect from head to toe. The Younger generations are just as hooked on Elvis as the older fans; it`s really pleasing to hear from younger fans. Elvis Presley` memory lives on! It`s fantastic to know he is getting the recognition he so rightly deserves. I`m sure you will enjoy your visit to Graceland, I believe the Meditation Gardens, is very peaceful, an experience to be treasured.